Also serving communities of Batavia, Ripley. There are 32 Assisted Living Facilities in the Milford area, with 5 in Milford and 27 nearby. To help you with your search, browse the 174 reviews below for assisted living facilities in Milford. On average, consumers rate assisted living in Milford 3.5 out of 5 stars. Better rated regions include Loveland with an average rating of 4.4 out of 5 stars. Caring.com has helped thousands of families find high-quality senior care. To speak with one of our Family Advisors about assisted living options and costs in Milford, call (855) 863-8283. The city of Milford is part of Greater Cincinnati yet has retained its close-knit community atmosphere. Seniors can get involved at the numerous events held each year, like the Easter Eggstravaganza, Frontier Days and the Hometown Holidays. There are five assisted living facilities in Milford for seniors wishing to retire to the area. A further 50 can be found in nearby communities like Cincinnati, Loveland and Mason. These facilities are monitored and licensed by the Ohio Department of Health and may have different licenses based on their size and the level of care they provide. Social Security Income is exempt from income tax in Ohio. Income from other sources, including pensions and retirement funds, is subject to income tax. Tax credits can help seniors keep more of their income for retirement living. Go Metro provides public transport in the Milford area, and seniors are eligible for reduced fares. Seniors may also be eligible for the Access program which provides origin-to-destination transport to people unable to utilize the fixed-route services. Milford has opportunities for art and culture lovers to indulge their passions. The Annual Art Affaire is an outdoor show held every spring, and music lovers may enjoy the outdoor concerts of the Second Saturday Music Series. When not at an event, seniors may enjoy visiting galleries like One Main Gallery or venturing into Cincinnati to see a show at the Aronoff Center. The overall cost of living in Milford is 98 on the Sperling index, 2 percent lower than the national average. Regular expenses like groceries and health care are significantly less expensive than the U.S. averages, allowing seniors to stretch their incomes further. Milford's overall crime rate is 35 per 1,000 residents, which is higher than 90 percent of Ohio's towns and cities. This is largely due to property crime, which occurs at a rate of 33 per 1,000 residents, compared to the state average of 25. Seniors moving to the area may need to consider steps to secure their belongings. The Milford area has few facilities from which to choose in the event of a medical emergency or illness, with the nearest major hospital located in Cincinnati. Assisted Living costs in Milford start around $0 per month on average, while the nationwide average cost of assisted living is $4,000 per month, according to the latest figures from Genworth’s Cost of Care Survey. Financial assistance may be available to seniors in Milford who live in assisted living facilities through the Assisted Living Waiver Program. The state also has an Optional State Supplement (OSS) available for eligible seniors who receive Social Security income. To see a list of free assisted living resources in Milford, please visit our Assisted Living in Ohio page. 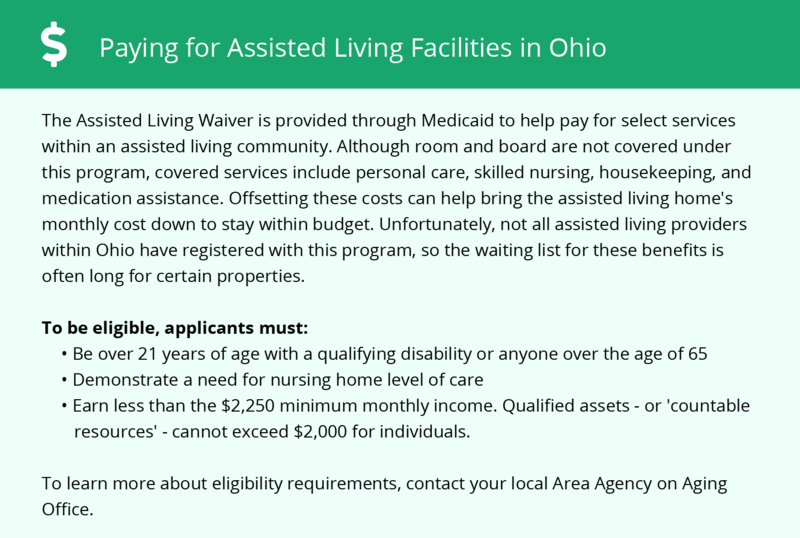 Milford-area assisted living communities must adhere to the comprehensive set of state laws and regulations that all assisted living communities in Ohio are required to follow. 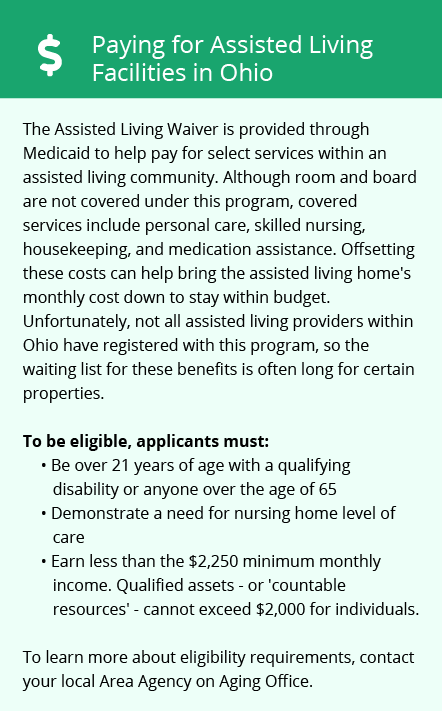 Visit our Assisted Living in Ohio page for more information about these laws.